From the start I told Domino's my goal was to open 10 stores in 10 years. I invested in my first franchise in Wickford in April 1999, raising the funds by going into partnership with my university friend Kevin Butler, selling shares to friends and family, borrowing from parents and getting a loan from the bank. Nine years later and Kevin and I are millionaires - we've just opened our ninth store, we employ 300 people and our business is turning over £6 million a year. I grew up in a village and didn't even know you could have pizza delivered before I took my first management position with a pizza company. I went to work in a delivery store and was amazed at how busy it was. There wasn't the room to move up in the company I was with, so when I saw Domino's start to innovate the market and expand rapidly through franchising I saw an opportunity to build my own business. At that point Domino's had 150 stores nationwide and in the time I've been a franchisee I've seen the brand explode in the UK. 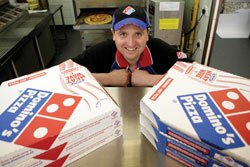 Domino's have their focus on quality, good value and quick delivery. That works for customers and we have a lot of franchisees making money and wanting to expand. The network has grown by 50 plus stores a year for the last four years and there are 500 locations now. We were fortunate in that our first store was a success from the start. I took a low salary and reinvested the profits into opening a second store in Braintree in August 2000. Then an existing store came up for sale in Chelmsford in 2002 so I took that on as well and had achieved my initial target of three stores in three years. Once you have a group of trained staff and have built your own experience it's much easier to continue to expand, so after a period of consolidation and paying back loans we opened three stores in 2005, two more in 2007 and hope to open our tenth by the end of this year. My bank manager says I'm the only one of his 200 clients that's still on track with their business plan after 10 years! Domino's offers plenty of opportunities and support to grow your business - if you're in it for the longer term the rewards are going to be higher. The entire outlook of Domino's is based on supporting the franchisee network - the more pizzas we're selling, the more money they're making. Their structure is completely designed to help maximise the potential of franchisees - I am a success story of that setup. The first five years I worked solidly and it was very hard work - seven days a week working all hours. As the business has expanded I've got more of a support structure in place within my company, which means I can begin to enjoy the fruits of my labour. I drive a brand new car, have a brand new house, travel first class, eat at expensive restaurants...all materialistic things! You do have to really dedicate yourself to the business but it gives you a good lifestyle.